Mergers and acquisitions don't just fall out of the sky fully assembled. They require countless hours of meticulous effort throughout their different phases, placing demands on team members from across an entire organization. Although your friends at Embark are admittedly biased towards the good deeds of our financial brethren, it's not a stretch to say accounting should play an indispensable role in any merger or acquisition that wants to be compliant and successful. To that point, if mergers and acquisitions are the rock stars of the financial world, think of accounting as the ever-important roadies that allow those rock stars to shine, accounting leadership the field generals for those roadies. In fact, every single concert requires a small army of roadies, guitar techs, and lighting wizards to make it a truly epic event. A lack of proper accounting support relegates a merger or acquisition to playing unwanted acoustic sets in front of a ravenous audience that wants screaming guitars from Everest-like stacks of Marshall amplifiers, not muted folk songs from an otherwise charismatic lead singer. The concert will be a disaster, the crowd will want their money back, and the band will be forced to do an ill-conceived reality show to carry their massive overhead. Simply put, just like the roadies, techs, and engineers that are instrumental in putting on a concert for the ages, accountants help support and drive a merger or acquisition in both obvious and subtle ways. Give Embark a few moments of your time as we detail a few of the most pivotal roles that you, our dear accounting director or manager, should play in helping reach M&A rockstar dreams. Before sitting down for marathon sessions with bankers that conclude with firm and hopeful handshakes, an accurate and reliable foundation must already be in place. Ownership, of course, will have a good idea what they want for either the entire company or piece of the company, and accounting must provide a firm footing for ownership to reach their goals. Sound accounting is the basis for successful negotiations that should be proactive to ensure the company is ready to sell in the first place. As obvious as it may sound, general ledgers need to be clean, old balances vanquished, and everything needs to be in full compliance with US GAAP. For example, the classification of assets and liabilities as current and noncurrent will be particularly important as components of net working capital – typically defined as current assets less current liabilities. These items could very well drive certain aspects of purchase price mechanics further along in the process and have a substantial impact on cash – something that concerns buyers and sellers alike. In general, all of the accounting should be clean and straightforward, compliant, and facilitate a streamlined process rather than be a hindrance. Since both mergers and acquisitions create more than enough work to keep everyone busy, these accounting efforts need to begin as early in the process as possible to prevent time crunches, anxiety attacks, and a general sense of chaos that could quickly disrupt – possibly destroy – the chances of a successful transaction. If ownership only wants to divest a piece of the company, prospective buyers will likely ask to see standalone financials that carveout figures specific to the target business. Consolidated financials don't provide enough insight into the overall health of the target business since the parent company could be performing very well despite a struggling subsidiary or two. Buyers need assurance that the target business is not one of those struggling subsidiaries and, thus, will want standalone financials. Generating those standalones can prove to be a time-consuming and highly involved process, especially when audited – not an unusual occurrence and often the first audit for the target business as a standalone entity. The auditors will likely incorporate lower materiality thresholds into their audit planning which could raise particular issues that never had a material impact on the consolidated financials. Usually referred to as the CIM, this is information gathered by bankers and advisors that serves as a summary of the opportunity and provides sufficient historical and projected financial information to permit interested parties to determine a rough bid or range of bids for the potential acquisition. The CIM plays a significant role to the bankers and advisors as they try to paint a favorable yet accurate picture of the target business to present to prospective buyers. Since the CIM will incorporate both historical and forward-looking financial information specific to the target business, it is the accounting department’s responsibility to present any historical financial information in a fair, accurate, and reliable manner. The data room is an important part of most deals, as it provides an organized and secure document repository through which much of the documentation exchanged as part of the due diligence process will flow. Early on in the deal process, the bankers and advisors to the deal will draw on their experience to assemble a list of the typical detailed documentation that prospective acquirers will need to see during their due diligence efforts. This documentation will provide more granularity behind the summarized historical and forecast financial information contained in the CIM, as well as allow interested parties to fine tune their own deal models and estimates of value and to build out synergy cases (for example, potential cost savings or revenue growth that may be realized by combining operations) as they do their best to justify the acquisition on their end. The list will typically include financial documentation such as detailed trial balances and profit and loss statements, historical capital expenditure schedules, tax returns, accounts receivable agings, organizational charts, listings of software licenses in use, and a variety of others. The accounting team will naturally be the source for much of this documentation. Bankers and advisors, in close collaboration with a company's finance department, will also assemble a Deal Model that projects earnings and cash flow for the next five years. This model will provide invaluable insight into which specific potential buyers marketing efforts should target. The accounting department typically provides input into the model and may even be expected to review the final document. Once the Deal Model is in place and marketing is in full swing, bankers will offer the CIM to interested parties. 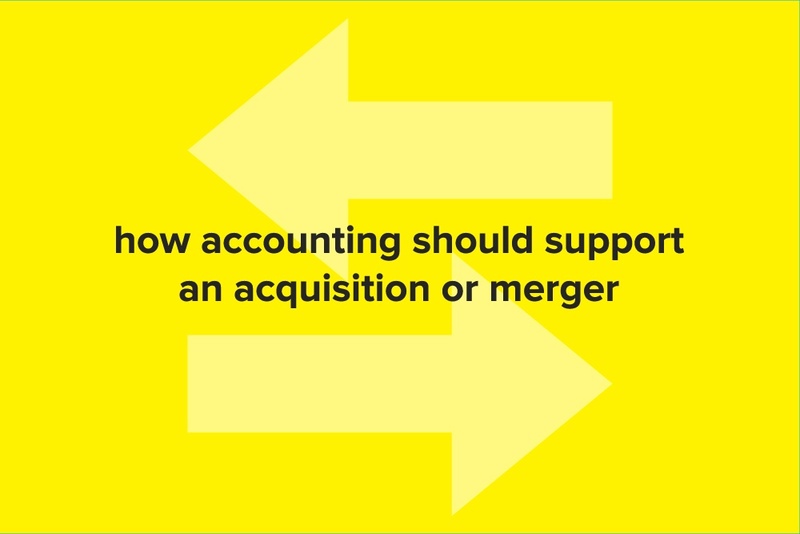 Of course, as logic dictates, the sheer volume of complexities involved in a merger or acquisition typically require several rounds of due diligence that should, once again, include accounting in several impactful ways. While no two deals are exactly alike, the following sections outline a commonly encountered two to three round process. Due diligence around initial bids usually only revolve around the information contained within the CIM. This information is sufficient to provide a first-round bid – a nonbinding bid or range of bids potential acquirers are willing to pay for the company or target business. This is territory for the more serious of suitors who aren’t just fishing for competitive proprietary information which, incidentally, is patently illegal. These are the rounds where non-disclosure agreements are executed and the data room is opened up to interested parties, and where due diligence becomes more exhaustive and detailed, resulting in follow-up questions that require more thorough, in-depth financial information. This typically includes detailed trial balances, P&L, line items, and anything involving significant or material contracts. Second and third-round bidding will also involve a series of due diligence calls that includes all involved parties. While accounting, finance, and legal departments as well as bankers, advisors, and outside counsel are most integral to these calls, they could also include representatives from operations and human resources. Ideally, questions will be provided beforehand to allow for pre-call preparation that might range from a few hours to a few days in duration. However, a word of warning from your expert friends here at Embark – do all of your homework ahead of time and know your books like the back of your hand. The CFO is always capable of pulling you into their office smack-dab in the middle of a call to answer questions with precisely zero prep time. This is not a moment to stumble on your words or scramble for information you vaguely recall seeing on one of many spreadsheets. Important Sidenote: Keep in mind that, concerning the FTC, there is specific information you cannot disclose per guidelines – particularly certain current and future pricing information and strategic plans. The FTC might request additional information during the review, including communication between the buyer and seller as well as internal documents if related to the proposed deal. Since even a whiff of anti-competitive information can stop approval dead in its tracks, make sure legal is aware of any direct communication between the buyer and seller until the deal is closed, even approving any such communication for content. The seller must conform to certain restrictions between signing and closing, usually requiring the business to maintain consistency with normal operations. Once the conditions to close are fully satisfied and the deal finalized, the new owners are finally able to take control. So the accountants have set up the mikes, tuned the guitars, and perfected the dramatic lighting for the M&A rock gods to take the stage. There might've been a few hiccups along the way but, as is often the case, attention to detail has paid off. This doesn't mean, however, that the concert is ready to be considered a resounding success since a whole new set of post-close challenges have now come into play, particularly true when a new business has been carved out from the seller’s broader operations. More than likely, the sale agreement contained specific provisions that will require the accounting departments from both the seller and buyer to be active participants after closing. For example, the purchase price might include a mechanism for a cash settlement of the difference between a net working capital peg – typically an average of the NWC balances over a certain number of quarters before closing – and the final net working capital between the buyer and seller on the closing date. In this case, the seller provides a final net working capital calculation – usually 60 to 90 days post-closing – which, when accepted by the buyer, determines how much cash the buyer provides the seller in an NWC shortfall. Conversely, cash moves from seller to buyer if the final NWC was greater than the peg number. This calculation is often assembled – or at the very least reviewed – by the seller's accounting team and likewise requires a thorough review by the buyer's own accounting department. Post-closing responsibilities might also include specific shared services functions. If, for instance, the seller’s larger corporate entity executed payroll, the buyer will often sign a Transition Services Agreement (TSA) that requires the seller to provide those payroll services for a specified period. These agreements are usually concessions made by the seller for the new owner to maintain continuity within the newly acquired company concerning those shared services. As the transition period progresses, the buyer will integrate the newly acquired company into their existing operations, gradually phasing out the services determined by any TSA's. Accounting systems are a critical component of this integration since the new owner will want to migrate all data and functions to their own systems. For instance, the buyer will typically want the newly acquired company to be on their own general ledger software which, of course, accounting will play an essential role by converging the chart of accounts and mapping the old chart of accounts to the new ones. Accounting must also assist with implementing the buyer's internal controls and governance processes at the acquired company. As an example, if the seller wasn't a public entity required to comply with the provisions of SOX 404 but the buyer is, an integrated audit must be performed and SOX controls put in place at the newly acquired company. The transaction will carry other accounting implications for both the seller and buyer as well. The seller records its receipt of consideration exchanged for the sold business along with the disposition of the sold business. The buyer records the acquisition that requires a conclusion on the appropriate ASC section to apply, including asset acquisition, business combinations, or VIE model. That particular topic, however, will be saved for another day. The gaze of the financial world can't help but affix itself on the dramatic glare of M&A. And like any good rock star, M&A requires a battalion of support to put on a good show that leaves everyone involved happy and content. Embark knows an excellent financial roadie when we see one so hunker down, kiddo, because your rock band needs you.